Oh “Big Bang Theory.” No matter how many haters say you’re lowest common denominator humor, you continue to be funny. Sure, it’s not high-concept comedy like “Community” or “Parks and Recreation.” But eight seasons in, this show is still making me LOL. I don’t care what that says about my taste in network comedies. When last we left the “Big Bang” gang, Sheldon, overwhelmed by the amount of change in his life, decided to hop on a train and live the hobo lifestyle while he cleared his head. Leonard and Penny might’ve been okay with this decision, but Amy was livid that he just wandered off without doing anything resembling consulting her. As she should be. The first episode, “The Locomotion Interruption,” kicked off with Sheldon at an Arizona police station, having had most of his stuff stolen. 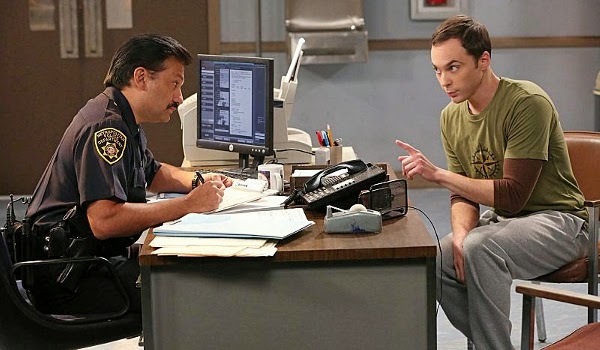 Probably the best line from the episode came from him trying to get a police officer to employ Holmesian methods of deduction: “There’s a lot of books called ‘Sherlock Holmes,’ but none called Officer Hernandez.” Oh Sheldon. Amy was even more ticked off when Sheldon called Leonard to come get him instead of her. As we learned later though, it was only because he didn’t want Amy to be disappointed in him. Awwww. I thought he was serious with that coitous line at first, but it was later pointed out to me that he only said that to make sure Amy couldn’t hear him. The opposite of awwww. The rest of the premiere involved two entertaining subplots: Penny’s job interview and Howard’s increasing discomfort with Stuart’s relationship with his mother. Penny’s interview was pretty predictable, but the way she got her job was perfect. I’m terrified of Bernadette too! She’s tiny, but her angry voice would be enough to whip Don Draper into shape. Maybe. I also appreciated that Stuart didn’t back down knowing Howard disapproved of how close he and Mrs. Wolowitz had gotten. He showed some backbone that he had never exhibited before. Their confrontation, where Howard basically treated Stuart like his dad and Bernadette like his mom (“Wife, I said my wife!”) showed that his real problem might be his daddy issues that have surfaced in recent seasons. I don’t know why, but this show has spent an inordinate amount of time humanizing Howard, and it has totally worked. If only it would spend as much time on Sheldon. The second episode, “The Junior Professor Solution,” halted all forward momentum that the last episode began, but it was so funny that I didn’t even care. It’s worth noting that Leonard and Raj have gotten next to nothing to do through two episodes besides being sounding boards for Sheldon and Howard, respectively. Raj is bound to have girlfriend problems eventually and I shudder to think what Leonard will be like as wedding planner. But for now, the focus has been squarely on the girls and Showard (trademarked). The main plot of this episode focused on Sheldon’s desire to drop String Theory and change his specialization to dark matter. The university’s solution: Make Sheldon teach a class on it. Seeing Sheldon try to deal with a bunch of brash grad students would’ve been great, but because he has a reputation for being himself, no one signed up to be tortured for their obviously inferior intellect. And yet, for some god forsaken reason, Howard decided that to make Sheldon feel better, he’d take his class. Considering that Sheldon thinks engineers are intellectual scum, he decided to take this challenge by devising a lesson plan that would make Howard feel like a moron. To which Howard, rightfully so, responded by firing a spitball into Sheldon’s mouth. That storyline was eventually resolved when the boys realized they were all geniuses and decided it didn’t matter who was smarter. That’ll probably last about five seconds if Howard sticks with that class. Something tells me he won’t, but I really would like to see more of that student-teacher dynamic between him and Sheldon. In girl world, we had a minor conflict between Penny and Bernadette — Bernadette wanted Penny to study harder for her new job, Penny thought Bernadette was being pushy — that escalated because of Amy’s desire for girl talk. This storyline could’ve only worked with Amy, who was so desperate to be the popular girl for once that she tried to keep the two of them fighting for longer. It was refreshing to see Penny and Bernie work out their differences like adults, with the usually mature Amy regressing to the high school experience she never had. Last thing: PENNY’S HAIR!!!!! Right when you thought Kaley Cuoco couldn’t get more beautiful, she pulls a J-Law and Emma Watson and totally rocks a pixie cut. Way to lock that up Leonard. Now don’t screw it up, like I’m sure you’ll be doing everything in your power to do this season.